This post was originally published in 2015 and is one of our most popular tutorials. It has been updated to reflect recent changes in MailChimp. Allowing people to receive your latest WordPress blog posts by email is a great way to build a following. Forget about RSS, Twitter etc. Some people just like to read the latest articles from your website using good old-fashioned email. Email marketing tools have always been a great way to share updates with your users and notify them of the latest trends. Today, I’m going to tell you how to use MailChimp to send out your latest WordPress blog posts by email. You can do it without any coding experience. And you don’t even need to install any plugins, as everything you need is already built into MailChimp and WordPress! You’ll learn how to email new blog posts to subscribers – either globally or specific categories only. I’ll also share some handy tips on how to take your blog posts by email to a new level. For example, I’ll tell you how to create a private members-only blog and email it to approved members only. Should I use MailChimp to send new blog posts? First, let’s talk through the different ways to send new blog posts via email. JetPack Subscriptions can’t be branded and allows your visitors to subscribe to your sites and other WordPress blogs under a single account. This may not be appropriate for a corporate blog. Subscribe2 requires a lot of custom development to look professional. The ‘Manage My Subscriptions’ page is in the WordPress admin rather than on the front end of your website. This isn’t appropriate for most websites. Another problem with sending bulk emails directly from your WordPress website is that your emails are more likely to be spammed. You can add features such as SMTP mail to increase email deliverability. However, WordPress is not a specialist email platform. Some WordPress hosting companies such as WP Engine (our recommended host) don’t even allow you to send mass emails directly from your website. This is because it uses a lot of server resources and can slow down your website. An alternative option is to use a specialist mailing list provider to email your subscribers when you publish a new WordPress blog post. Their servers are configured to maximise deliverability so your emails are less likely to be flagged as spam. They also have built-in features to help you comply with data protection legislation. And you also get professional options for email templates that aren’t available with most WordPress plugins. MailChimp is the world’s leading mailing list provider, and is free until you have 2,000 subscribers. 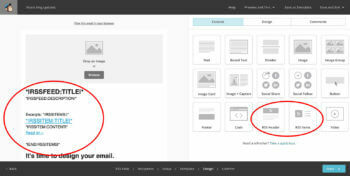 This article explains how to use MailChimp to send your WordPress blog posts by email. 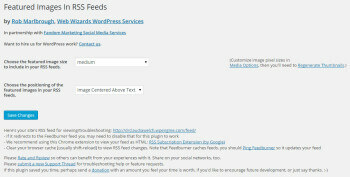 WordPress automatically generates an RSS feed listing all your blog posts. This is all you need to integrate MailChimp with your WordPress website. If you want your MailChimp emails to display all the posts that you add to your website then your RSS feed will be https://your-domain.com/feed/ (e.g. the RSS feed for this website is https://barn2.co.uk/feed/). If you want to email your subscribers when you add posts to a specific blog category then the RSS feed will be the URL for your blog category followed by feed/ (e.g. https://barn2.co.uk/category/wordpress-web-design-blog/feed/). Find the URL for your RSS feed and save it in a handy place, as you’ll need to paste this into MailChimp later. Important note: The trailing slash / is compulsory, and MailChimp will only recognize your RSS feed if you add it as https://barn2.co.uk/feed/ rather than https://barn2.co.uk/feed. 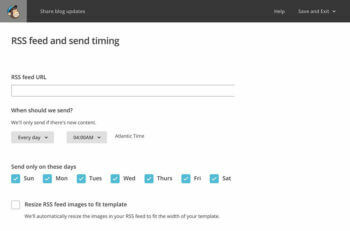 By default, any images that you insert into the main content area of your WordPress posts will appear in your MailChimp emails. However featured images will not, because WordPress doesn’t output them into the RSS feed. There’s a handy plugin called Featured Images in RSS and MailChimp Email (what a mouthful!). 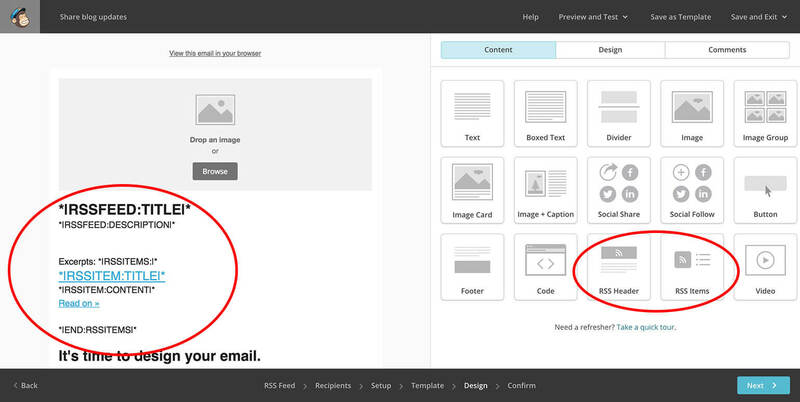 This outputs the featured images into your RSS feed so that they are pulled through into your MailChimp emails. Simply install and activate the plugin, go to Settings > Featured Images in RSS Feeds in the WordPress Admin, and configure the 2 settings. For best results, I recommend selecting the ‘Medium’ or ‘Large’ image size and ‘Image Centred Above Text’ for the position. The plugin uses the image sizes that you have set in Settings > Media so you can change the size of your Medium or Large image size. Make sure your chosen image size is smaller than 600 pixels – if it’s bigger than this, it won’t fit into the available space in your emails (annoyingly, MailChimp won’t make the images fit automatically). Can I display other WordPress content types instead of blog posts? Yes! WordPress posts and ALL custom post type come with RSS feeds that you can use to send alerts via MailChimp. You can use exactly the same method to send email notifications for new events, projects, e-commerce products and more. Check out our separate article about how to send ‘New product’ alerts from your WooCommerce store. First, go to mailchimp.com and create an account. It’s free to set up and you will only ever have to pay anything to MailChimp if you have particularly high numbers of emails or subscribers (view their pricing page to see if this will apply to you). Go to the Audience section of your MailChimp account and create a new audience (previously called ‘list’ in MailChimp – they changed it in 2019). This is where all your subscribers will be stored. Follow the instructions to set up and configure a new audience. Go to the Audience section of your MailChimp account and click on your audience. Click ‘Import subscribers’ from the ‘Add subscribers’ dropdown list. Follow the instructions to upload your CSV file. MailChimp will ask you to match the columns in the CSV file with the fields for your MailChimp audience, then you can go ahead with the import. MailChimp will tell you if there are any problems with the data. Note: Your subscribers will NOT receive an email to tell them that they have been imported into your MailChimp audience. A ‘Campaign’ is basically any email that is sent by MailChimp to your subscribers. The next step is to create an RSS-Driven Campaign which will automatically send your new blog posts to your subscribers. Select any Template and then click through to the Design tab. You can use MailChimp merge tags in the subject line, for example to include the title of your latest post. For example, we use MailChimp to send our own Barn2 blog posts and tutorials by email each week. The subject line is ‘*|RSSITEM:TITLE|*’ & More! For example, if our latest post is called How to use MailChimp to send WordPress blog posts by email then the subject of the weekly RSS email would be ‘How to use MailChimp to send WordPress blog posts by email’ & More! To automatically include your new blog posts in the email, you need to add the RSS Header and/or RSS Items content block into your email. Find this in the Content section of the Design tab. The RSS Header element will add the title and description of your RDD feed and isn’t essential. The RSS Items block will add the title, content and a link to each new post on your WordPress website, so this is essential! 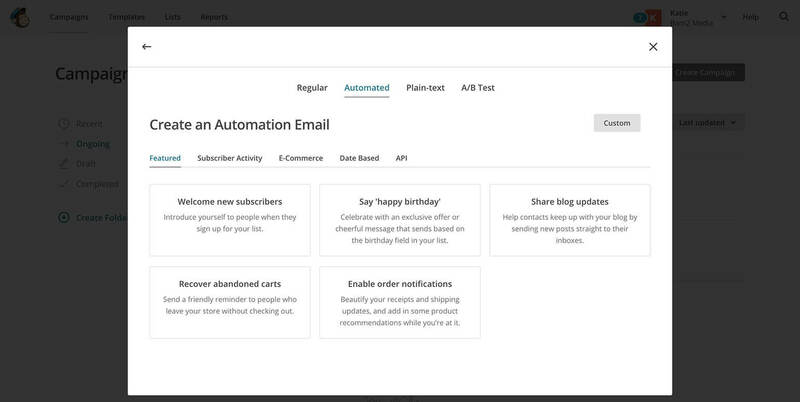 MailChimp will let you make various design changes to the email using the Style tab. This includes changing the background colour, fonts, spacing, link colour etc. Use these to style the email to match your brand, as well as uploading your logo to the header of the email. Once you have finished designing your email, click Preview and Test at the top of the screen. Enter Preview Mode lets you view how the email will look on mobiles and full-sized screens. Send a Test Email lets you send a test email to yourself. Test your email in both of these ways before sending anything to your subscribers. Once you’re completely happy with your email, click Next at the bottom right of the screen. On the next screen, check there are no errors. If everything looks good, click Start RSS. Now your email is set up and will start being sent to your subscribers at the frequency you have selected. The email will only be sent when you have added new blog posts to your website, otherwise nothing will be sent. Now everything is in place, you need to create a signup form so that readers can subscribe to your blog by email. The best way to do this is usually to add a ‘Receive blog posts by email’ form to the right hand column of your blog or website. You can see this in action in the sidebar of this page. There are lots of WordPress MailChimp plugins that will add a signup form for you. I recommend ChimpMate Pro which is a popular option. 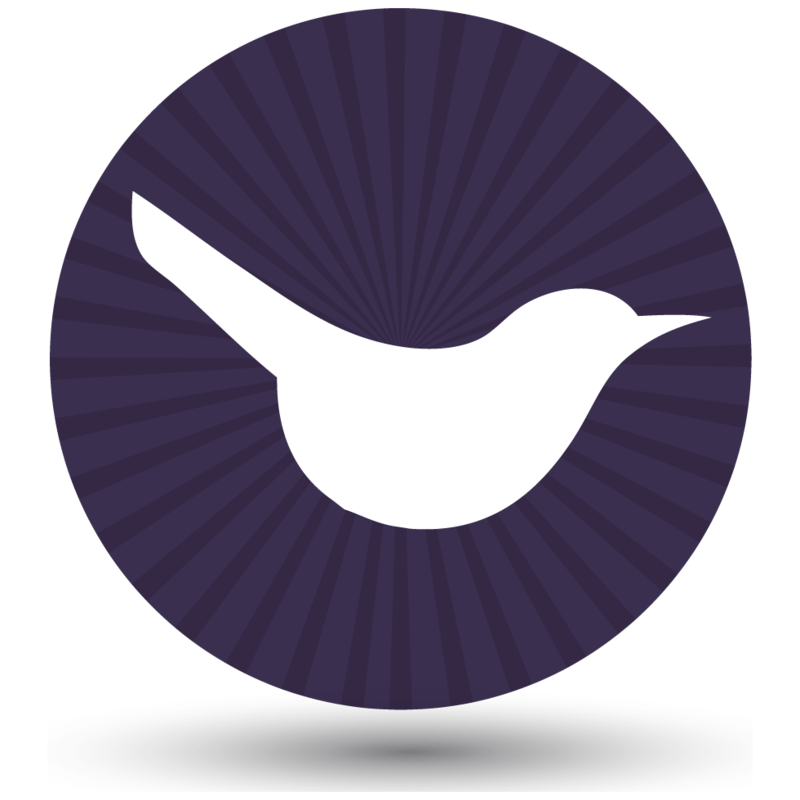 It’s simple to set up, has great reviews and there’s a free version as well as the premium version with extra features. There are many other ways to build your MailChimp mailing list and I won’t go into them all here. For example you can automatically subscribe people who comment on your blog posts, purchase in your e-commerce online shop, submit your contact form, etc. Plan the best way to grow your mailing list as part of your overall online marketing strategy. Step 4 – Start blogging! Everything is now in place. Regularly add new posts to your WordPress website and MailChimp will take care of the rest. 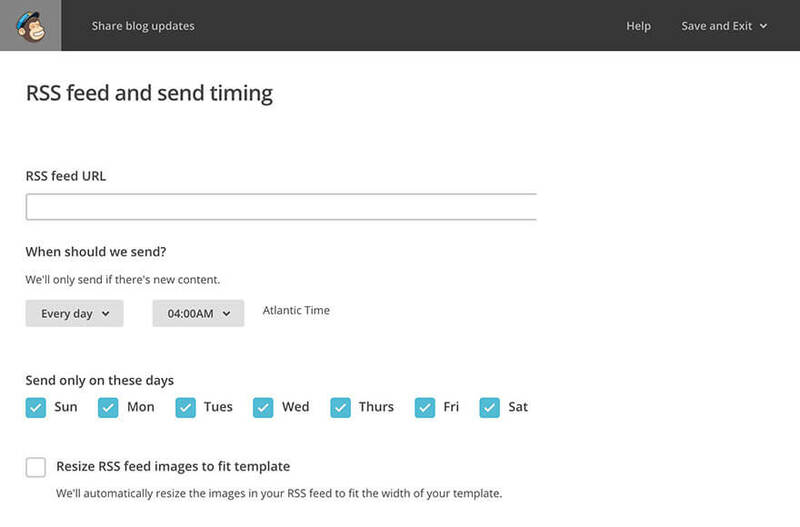 MailChimp will automatically check when new posts are available in your RSS feed, and will email your subscribers at the specified time. Make sure you subscribe to your own list so that you receive the emails yourself. This allows you to spot any problems and make improvements over time. So far, I’ve assumed that your WordPress blog is private and everyone can access it. But what if you want to mark part or all of your blog private and members-only? What if you only want to send the emails to members? Install our WordPress Password Protected Categories plugin. Use it to password protect any or all of your blog categories. Use the instructions in Step 1, above, to get the RSS feed URL of the category (or categories) you wish to email to members. Follow the instructions in Step 2, above, to create a MailChimp Campaign to email new blog posts in the private category. Add the password to one of the static sections of the email (outside of your RSS merge tags), with instructions to use it to unlock the private blog. You may wish to create a Group or Segment within your MailChimp Audience for your private blog members, and set the Campaign to only send to this Group/Segment. Finally, decide how members will sign up for the private blog. If they have already joined your organisation separately then you can simply import them to MailChimp. Alternatively, you may wish to use a plugin such as Gravity Forms to create a MailChimp signup form that links with PayPal, so members have to pay to sign up. The easy way to create a private WordPress blog. As you can see, there are lots of ways to integrate your WordPress blog with MailChimp – and you don’t even need a MailChimp plugin! And if your requirements are more complex, then you can combine this method with other WordPress plugins to add extra features. For example, you can add fancy MailChimp signup forms or even make parts of your blog private so that only existing members can read them and receive the emails! Thanks for the helpful article! I have one question: I already have Mailchimp and a newsletter sign up for my blog. People have asked for the option to get new posts via email, so I'm trying to figure out how to offer that. Do I start a new list within Mailchimp? If so, are there two separate sign-up boxes on my blog, or is there a way to format it so they can choose newsletter and/or get posts by email in one box? Yes, you can do this. 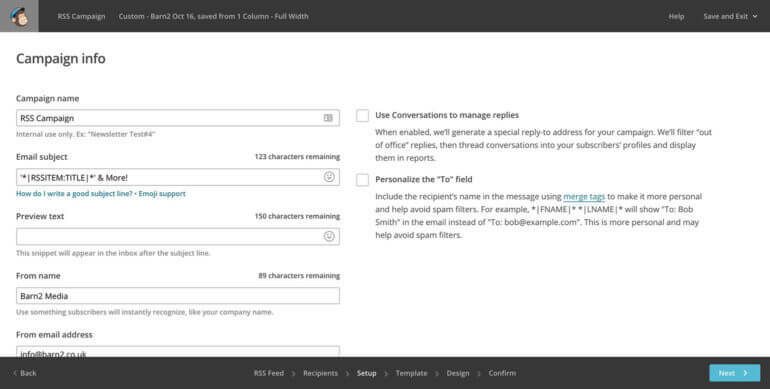 Create 2 groups within your main MailChimp list, e.g. 'Newsletter' and 'Posts'. Use a plugin such as ChimpMate Pro to create a signup form that includes tick boxes that allows people to tick which groups they want to join. When you follow the instructions in this tutorial to create an RSS-driven MailChimp campaign for your new blog posts, make sure you choose for it to send to the 'Posts' group only, and not the full list. That way, you can do everything you need from a single list. Great- thanks for the clarification! Hello and thank you for your post on RSS emails. I created mine and it functions properly as far as generating the daily emails from my posts... however, the CONTENT area is completely unformatted without any paragraph breaks, even though content is separated in WP blocks on my site. The result is a completely elementary and almost unreadable stream of sentences rather than something closer to professional email. Can you advise how I might resolve this? Many thanks! Hi, I think that the content field can only display plain text but it's worth sending a support request to MailChimp to make sure. If that is the case and isn't suitable for the type of content in your posts, then I recommend showing the Excerpt/Description in the RSS email instead of the full content. Such a great article! One question...I have tried everything I know to do but cannot get my subscribers that have signed up on Wordpress to add to my Mailchimp list?? Help! Hi Jaime, sounds like something isn't configured correctly in whichever plugin you're using to create the MailChimp signup list. I recommend that you send a support request to the plugin author and they can help you ensure it's linked up with your MailChimp list correctly. Hello, this is an excellent article and super helpful. I know that the directions are for new blogs, but is there a way to send previous blogs not triggered via RSS? For example, what if I wanted to curate 3 different articles across different categories. Is there a way I can do that? Thanks in advance for any insight. The only way to do that automatically would be to change the publish date of the posts so that they appear as new posts in the RSS feed. Otherwise you would need to add them to a campaign manually. Hello! Nice post. Thanks for this! I have a question : What about if we have a multilanguage website? Mine is french and english. So, do i need to have two mailshimp accompt or the same one? For exemple, a french list and english list? Yes, if you have a multilingual website then you would have a different RSS feed for each language. You would need to create 2 separate campaigns, each with the correct RSS feed for that language. I am sorry if you have already answered this question, but now that I have set up to send new blog posts through Mailchimp, do I need to turn off whatever was originally sending my blogs to my subscribers on Wordpress? I do not want them to receive duplicate emails. Yes, that would be a good idea if you already have something equivalent in place. Yes, you would need to create 2 different blog categories, and then create 2 different MailChimp campaigns - one for the members, and one for everyone. Each category will have its own RSS feed (as described in the article above) so you can link each MailChimp campaign with a different category/RSS URL. Even though 1 of the blog categories that I have require a membership? It will automatically post to my website but only be viewable by members? To create a blog category that is only viewable to members, you will need to password protect it with our Password Protected Categories plugin. 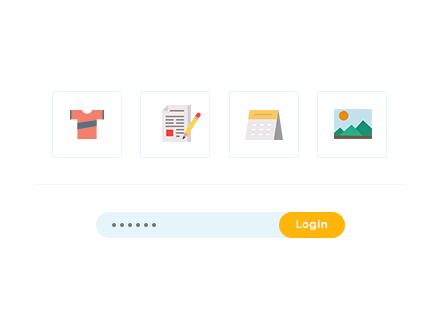 You can then use MailChimp to send an email to your members, which should include the password so that they can easily unlock the hidden category. So then I am guessing when I am done setting up mailchimp, I have to erase all of my Jetpack subscribers because they would be getting double notifications as well as notifications about emails that were only meant for paid for subscribers. Correct? Yes, this would be instead of Jetpack Subscriptions. You can export them and then import them to MailChimp. I already have password protected content with a memberships program... It's not a category because it's its one set of categories on the post page that is called, "Required Membership" Will that suffice? Yes, that should work. You just need to think about the best flow for your users in terms of how they sign up and access the protected content. Can Mailchimp send notifications about new posts immediately? Not scheduled? Do I need another plugin for that?? MailChimp can only do it on a schedule, but you could set the schedule to the maximum frequency.